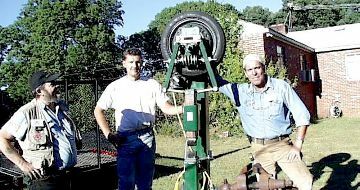 The Tirehammer Clutch Mechanism, invented by Ray Clontz, from Charlotte, NC is truly ingenious. AND it works very smoothly as well as being easy to build. The hammer speed is very easy to control with the clutch and takes no practice to get used to feel. The mechanism is simple. 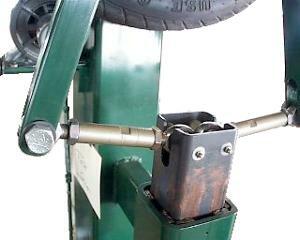 A steel wheel on the motor shaft rubs an inflated rubber tire. In this case the tire was an unused mini-spare and wheel. The tire and wheel run on the automotive hub with the OEM dual Timken bearings. 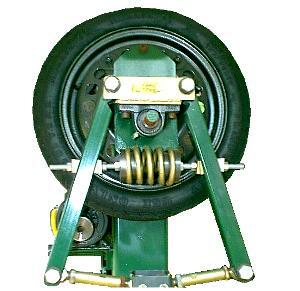 To operate, the motor base is mounted on a pivot bearing and rotates to engage the steel wheel into the tire. The clutch both slips smoothly and engages positively when needed. The hammer mechanism is a clone Little Giant toggle linkage made with a pillow block bearing and used tie-rod ends from Stirling Marlin's race-car (real NC stuff!). The ram is a tube within a tube. This was a little sloppy but it worked. Built on a tight schedule the hammer's anvil was merely a piece of tubing supporting the die. It was replaced with a 400# piece of steel by Jim Wilson. Left to Right, Proud new owner Jim 'Paw-paw' Wilson with builders Paul Garrett and Steve Barringer. Paul built Winston Cup race cars and is the resident smith at John C. Campbell Folk School. COMMENTS: Although this hammer worked well there was a lot that needed to be optimized. The machine ran a little bit slow for a small ram weight machine (40# to 50#). It could stand a larger steel drive wheel or a smaller diameter tire. With this change the spring would need to be a little heavier to perform optimally at full speed. The faster the machine the stronger the spring needs to be to keep proper timing. 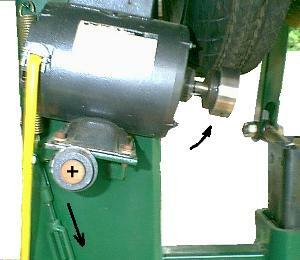 Above: Tilting motor clutch. While many have moved away from this design it seems to give better feathering than others. The tire is nearly round so the angle of contact is not critical. Above: Dupont style linkage. The use of the pillow block is very efficient and others attempts at replacing it have been complicated and expensive weldments. So why not spend the $20? 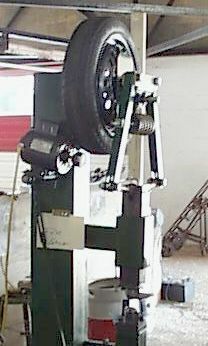 The spring adjustments on this tire hammer use structural steel taper washers to compensate for the angle of the arms. LEFT: This quick and dirty guide assembly needs adjustments. The plastic guides are quite sloppy which reduces the hammer efficiency AND tends to kick work out of the dies if not perfectly square to the die surfaces. The steering rod ends are race car scrap. They make beautiful toggle links. 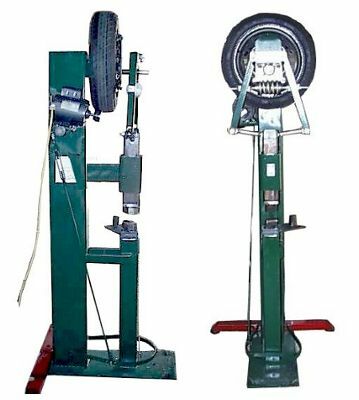 The tire hammer was designed to be built by some of my blacksmith friends who had the following eqipment. Small grinder - If they wanted to clean up the torch cuts. The first few hammers were built from a concept sketch. The next- maybe 15 - 20 were built by smiths who went to see some of the early hammers, and quite a few were built by smiths looking at emailed pictures of the early hammers. None of the early hammers were alike, only the use of the tire and DuPont linkage. They had different arm lengths different springs (some off farm equipment - some from motorcycles) As far as I know all the hammers worked very good and the builders were pleased with the hammers. To build one is definately not rocket science, Thumper (a builder) built one using only an O/A torch to do all the welding as he did not own an electricd welder! Note, there are NO machined parts in the early design hammers. The only REAL machined part in the Clay Spencer version is the aluminum drive wheel on the motor. The early hammers used a short length of tubing welded to a pulley or sprocket that fit the motor shaft and the od would fit into the tubing and be fairly concentric.